Flashback to 2006, but we’re trying to solve the challenge of searching and indexing the audio in videos again. Case in point: TechCrunch Disrupt finalist Koemei, for example. Another new one hitting the startup scene today: Mobento, a company which not only finds videos where words you search for are spoken, but which also shows you a timeline indicating where in the video those words can be found. The company was founded by Sumner Murphy, who has startup and engineering experience, but nothing that seems to be specific to solving the challenge of indexing audio in particular. Based in both N.Y. and London, Murphy previously ran a consulting firm in N.Y. specializing in web development, where he did work for the educational sector. Mobento, too, has a focus on the educational sector, describing its vision as related to the intersection of tech and education (“technology can and should serve education better than it does” reads the FAQ). Founded in December 2011, Murphy recruited a small team of three developers and a designer to build the site. 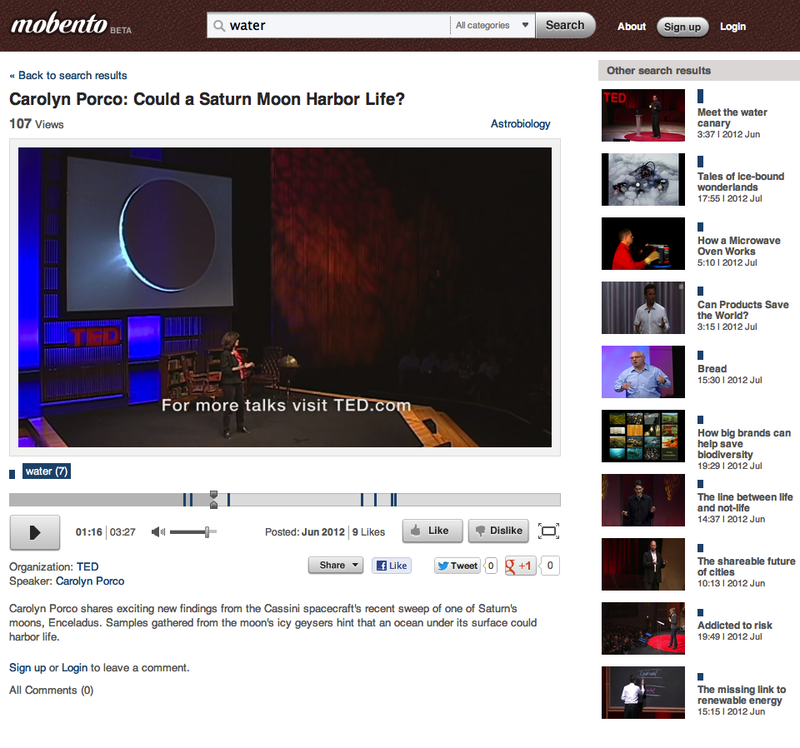 It houses 250 videos now from Stanford lectures, Khan Academy, and TED. From an end user’s perspective, it works as advertised. For example, a search for “water” led here, and yes, clicking those blue lines in the timeline take you to spots in the video where the word is spoken. Murphy is traveling at present, but told us via email that Mobento has an undisclosed amount of seed funding from private investors, which closed in January 2012. They weren’t on AngelList, so who knows. Unlike Koemei, this isn’t a transcription service. Nor is it some kind of integration play to connect human transcribers with videos. Instead, all the translation is completely automated and all the indexing on the Mobento website is machine-generated. If the auto quality is high, the company says that it can extract over 90% of the significant keywords. Over time, the expectation is that this will improve. What’s concerning is that Mobento seems to think this is never before seen technology. While maybe nothing is “exactly” like it (nothing is exactly like anything), there are other providers for video search and indexing (and sometimes transcriptions, too) that have ranged from the enterprise-facing to research projects to speech-to-text efforts from Google, captioning search from Hulu, larger video platforms, failed startups and more. But when asked about the competition, Murphy’s response was just that “no one else currently offers this kind of search, although meta-data-based video search technology does exist for the likes of YouTube and Google.” Maybe it’s a pet peeve, but unless you’ve just invented teleportation or something, you’re better off acknowledging other efforts, rather than pretending they don’t exist. That being said, this is one of the arguably more user-friendly interfaces we’ve seen as of late. The service soft-launched on Friday, and Sumner says they’re now “in discussions” with some unnamed educational bodies with video content. Stay tuned.